Effect: A plastic beaker floats in the air. Secret: On one side of a plastic beaker attach a strip of strong paper. It is important that the paper is loose along the centre portion. 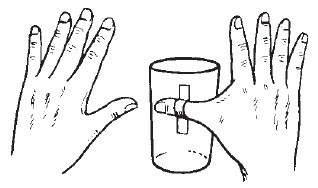 To make the beaker appear to float, you push your right thumb through the paper loop. Place your left hand near your right hand and then lift your hands in the air. With practice it will appear that the beaker is floating in the air. Keep the taped side of the beaker nearest your body so the audience do not see it.